Extract used primarily as a fragrance and flavoring agent. The vanilla plant is a source of catechins (also known as polyphenols), which exhibit antioxidant activity and serve as anti-inflammatory agents (Source: Drugs Experimental Clinical Research, 2004; 30(1):1–10). When vanilla is grown in cultivation the deep trumpet-shaped flowers have to be hand-pollinated - except in Mexico where the native humming birds do most of the work. Vanilla is a flavor derived from orchids of the genus Vanilla, primarily from the Mexican species, flat-leaved vanilla (V. planifolia). The word vanilla, derived from the diminutive of the Spanish word vaina (vaina itself meaning sheath or pod), simply translates as little pod. Pre-Columbian Mesoamerican people cultivated the vine of the vanilla orchid, called tlilxochitl by the Aztecs, and Spanish conquistador Hernán Cortés is credited with introducing both vanilla and chocolate to Europe in the 1520s. Initial attempts to cultivate vanilla outside Mexico and Central America proved futile because of the symbiotic relationship between the vanilla orchid and its natural pollinator, the local species of Melipona bee. Pollination is required to set the fruit from which the flavoring is derived. In 1837, Belgian botanist Charles François Antoine Morren discovered this fact and pioneered a method of artificially pollinating the plant. The method proved financially unworkable and was not deployed commercially. In 1841, Edmond Albius, a slave who lived on the French island of Réunion in the Indian Ocean, discovered at the age of 12 that the plant could be hand-pollinated. Hand-pollination allowed global cultivation of the plant. Three major species of vanilla currently are grown globally, all of which derive from a species originally found in Mesoamerica, including parts of modern-day Mexico. The various subspecies are Vanilla planifolia (syn. V. fragrans), grown on Madagascar, Réunion, and other tropical areas along the Indian Ocean; V. tahitensis, grown in the South Pacific; and V. pompona, found in the West Indies, and Central and South America. The majority of the world's vanilla is the V. planifolia species, more commonly known as Bourbon vanilla (after the former name of Réunion, Île Bourbon) or Madagascar vanilla, which is produced in Madagascar and neighboring islands in the southwestern Indian Ocean, and in Indonesia. Leptotes bicolor is used in the same way in South America. Vanilla is the second most expensive spice after saffron, because growing the vanilla seed pods is labor-intensive.Despite the expense, vanilla is highly valued for its flavor, which author Frederic Rosengarten, Jr. described in The Book of Spices as "pure, spicy, and delicate"; he called its complex floral aroma a "peculiar bouquet". As a result, vanilla is widely used in both commercial and domestic baking, perfume manufacture andaromatherapy. Vanilla essential oil is a viscous dark brown liquid with a rich, sweet, balsamic, vanilla-like odor. It blends well with sandalwood, vetiver, opopanax, benzoin, balsams and spice oils. Vanilla planifolia is a species of vanilla orchid. It is native to Mexico, and is one of the primary sources for vanilla flavouring, due to its high vanillin content. Common names are Flat-leaved Vanilla, Tahitian Vanilla (for the Pacificstock formerly thought to be a distinct species), and West Indian Vanilla (also used for the Pompona Vanilla, V. pompona). Often, it is simply referred to as "the vanilla". It was first scientifically named in 1808. Vanilla planifolia is found in Central America and the West Indies. It prefers hot, wet, tropical climates. It is harvested mostly in Mexico and Madagascar. Like all members of the genus Vanilla, V. planifolia is a vine. It uses its fleshy roots to support itself as it grows. Flowers are greenish-yellow, with a diameter of 5 cm (2 in). They last only a day, and must be pollinated manually, during the morning, if fruit is desired. The plants are self-fertile, and pollination simply requires a transfer of the pollen from the anther to the stigma. If pollination does not occur, the flower is dropped the next day. In the wild, there is less than 1% chance that the flowers will be pollinated, so in order to receive a steady flow of fruit, the flowers must be hand-pollinated when grown on farms. Fruit is produced only on mature plants, which are generally over 3 m (10 ft) long. The fruits are 15-23 cm (6-9 in) long pods (often incorrectly called beans). They mature after about five months, at which point they are harvested and cured. Curing ferments and dries the pods while minimizing the loss of essential oils. Vanilla extract is obtained from this portion of the plant. The major chemical components from the pods are vanillin, vanillic acid, 4-hydroxybenzaldehyde and 4-hydroxybenzoic acid. Otherwise known as the sweet violet, the leaves and flowers are antiseptic, astringent, demulcent and antioxidant (rich in vitamins A and C). Its active constituents include: salicylic acid and other phenolcarboxylic acids, 10% mucilage, flavonoids, anthocyanidin glycosides, carotenoids, coumarins, a-tocopherol, peptides and 29 or 30 amino acids. One quirk of the violet is its elusive scent – along with terpenes, a major component of the scent is a ketone compound called ionone, which temporarily desensitizes the receptors in the nose; sniff all you like, you won’t get any more smell from the flower. Violets are excellent for dry, normal and oil-rich skin and are included in facial steams, cleansers, toners, lotions, moisturizers and bath herbs. 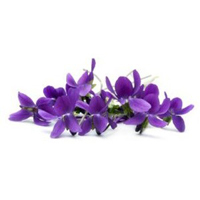 Used internally, violet may help to clear the skin of acne, boils, eczema and psoriasis. The oil is good for insomnia, sluggish circulation and stress.